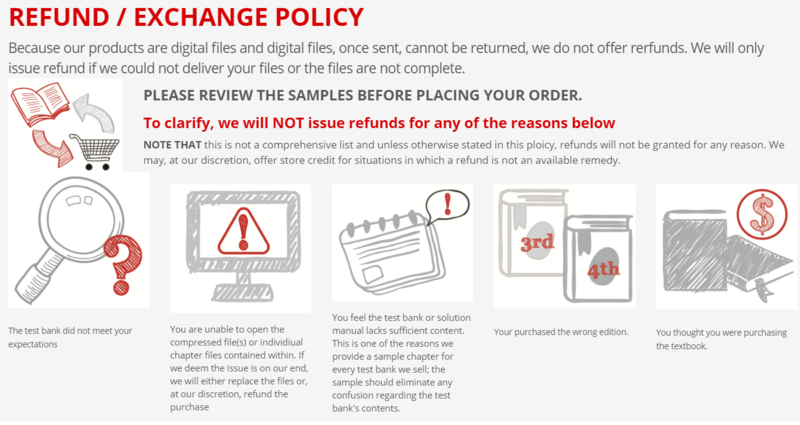 We offer full refund for technical issue of you account for example: you were charged twice or you paid and never had access to the account etc, once you start using our premium services and having access to all test banks we don’t issue refunds. We have plenty of free samples for each book to help you decide if its worth it to become a premium user. As always contact us if you have questions before becoming a member. The reason is because some users paid to become a member, then copy all test banks they need, and request a refund so they can get all the products for free, in other words online shoplifting. If a users after becoming paid members start a dispute or charge back with their bank, then we must provide evidence to the bank of the legitimacy of the transaction e,g: IP address, logs files(logins, logouts, time spent in the site etc..) as a proof that the buyer did purchase the services. Please be aware of the consequences of online shoplifting or friendly frauds. We only collect your email address, and we will NOT send any marketing email.